Friday morning, while wrapping up a requirements meeting with my boss and a developer, my phone vibrated and displayed the name of Daddy’s neighbor. I excused myself and took the call. A million things instantly ran through my head. 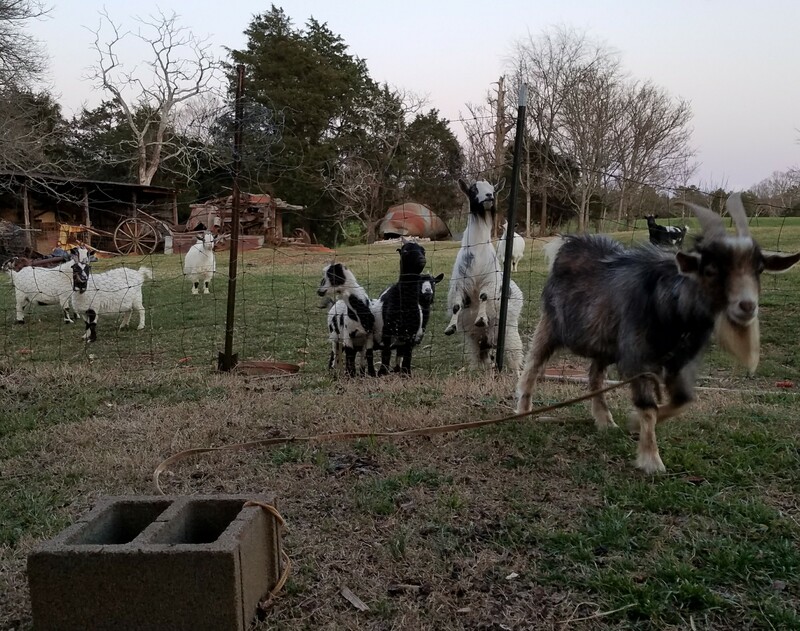 He said, “I hate to call you at work, but one of your dad’s goats is standing in the road, he won’t move and I think he’s chasing cars. I just don’t want him to get hit.” This man whom I’ve known my whole life and whose wife was one of my teachers, has a calm demeanor and nothing ever seems to upset him. His genuine concern for daddy’s goat and our family immeasurable. I asked, “is it the gray one?” When the reply was yes, I thanked him, assured him that I would take care of it and would let him know of we needed anything. My co-worker, Steve, just shook his head at the goat’s antics. Now, before you say, “poor Steve” let me say that I do not like tie-outs. However, in Steve’s case, he prefers it. How can we tell? He is calm and he smiled. He lived the first 9 months of his life with his prior owner on a leash and living in a doghouse. Steve is on the other side of the fence from his ladies and seems to love the single life of a “ball and chain”. He has shelter, food, water and is loved. Now, we’re prepping for a new solar-powered electric fence that will house both he and Sam in temporary-movable areas for cleanup of privet and vines. I’m just thankful for an employer who understands that you can take the girl out of the country, but you can’t take the country out of the girl. In my line of work as a business analyst, some say that it’s difficult to find the right mix of IT/business process design. You don’t always get this eclectic mix. When you ger me, it’s that mix plus volunteerism and farming. At a volunteer event over the weekend, someone commented, “you’re real.” I may not be Santa Claus, but yes, gentle readers, Janet is real.